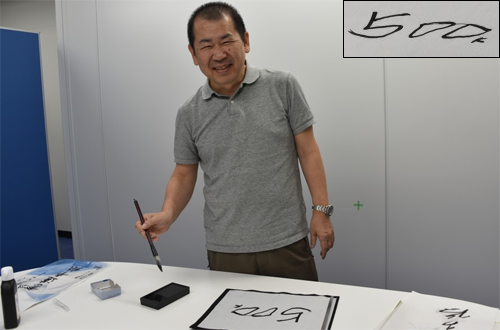 Right after the release of an in-development teaser video for Shenmue III, Gamescom 2017 in Cologne brought developer Ys Net into the center of a media feeding frenzy, with director Yu Suzuki’s schedule fully booked with interviews that continue to surface on websites of varying languages. 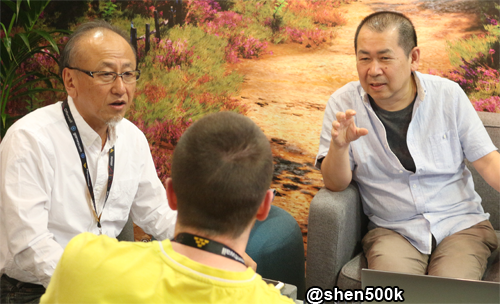 Nonetheless, the legendary creator behind some of Sega’s best loved games (including Virtua Fighter, Out Run, Space Harrier, Daytona USA, and more) still managed to squeeze in two busy Meet & Greet sessions with fans and some exclusive interviews with the Shenmue fan community. You can already read Shenmue Dojo’s interview on their forum, and another from French site Shenmue Master is on its way. But what follows is the first interview conducted by Shenmue 500K, the series’ largest dedicated Facebook group whose burning questions were crowdsourced from members across the globe. Relaying these questions on the group’s behalf were Sílvia Vila Tarrés from Barcelona and James Hamill from the UK. 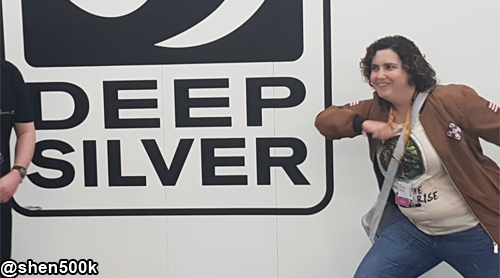 The first of the questions asked in our allotted time came from Matt Oliver, who was curious about the expanded scope of Shenmue III thanks to the recently announced publishing deal with Deep Silver, whose enclosed booth in the business area of Gamescom we were occupying. Did a “bigger and more beautiful” game mean that stretch goals not attained through crowdfunding were now achievable? Another 500K member, Adam Clark, wanted to know if the player would be able to choose between English and Japanese voices in the game. “But you understand the wish?” Morishita asked him. “Yes, it’s clear,” he replied. So it appears to be a concern for the director that including audio and, we’d assume, lip synch data for both languages may be an issue in terms of disc space – a limitation that strictly governed development of the original Dreamcast games on GD-ROM. How big a limitation this proves to be with PC and PlayStation 4 remains to be seen, but we now know that a dual audio option is an ambition that Suzuki will at least explore. As Morishita chuckled at the director’s remarks, Suzuki opened slides on his laptop showing some of the on-screen display elements being designed, including a temporary version of the four action buttons such as the mouth icon for speaking to another character. For a temporary design the display looked great to us, but most importantly for Calvin’s question it was clear they were aiming to recreate the same OSD elements familiar to fans of the previous games, and our brief preview brought home a feeling that Shenmue III itself was indeed real, tangible, and in actual development as we spoke. 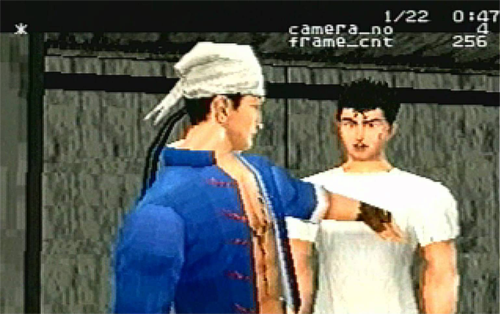 Alexander Flodén spoke for many Shenmue history buffs, including Shenmue III advisor Ryan Payton who admits to a preoccupation with this subject, when he asked if fans will ever get the chance to play the Shenmue prototype originally in development for the Sega Saturn. 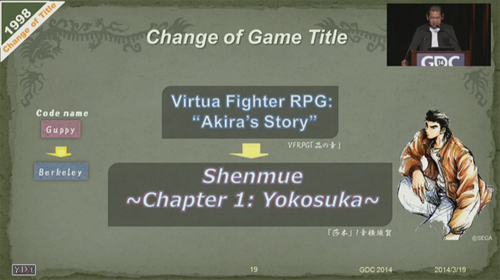 Specifically, how far had that version advanced before work shifted onto the Dreamcast? “Thirty percent,” came Suzuki’s reply. Even so, perhaps Ryan will one day lay his hands on an unlabelled disc from Sega’s vault and reveal a further glimpse of that trial run. We have a feeling the holy grail for some enthusiasts will remain a topic of speculation for some time to come. “That could be difficult! I think it would be best to make a request to Sega about that,” said Yu-san. 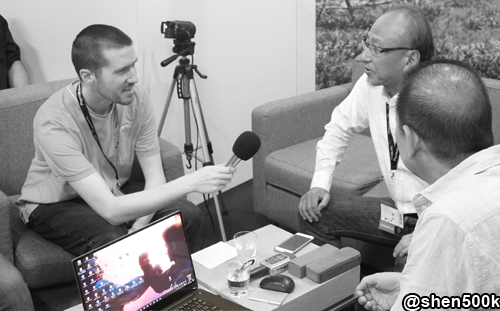 Surprises were the topic of our final question from Christos Liousas, who wondered if Suzuki had any stories about strange or unexpected places he’d encountered Shenmue fans. 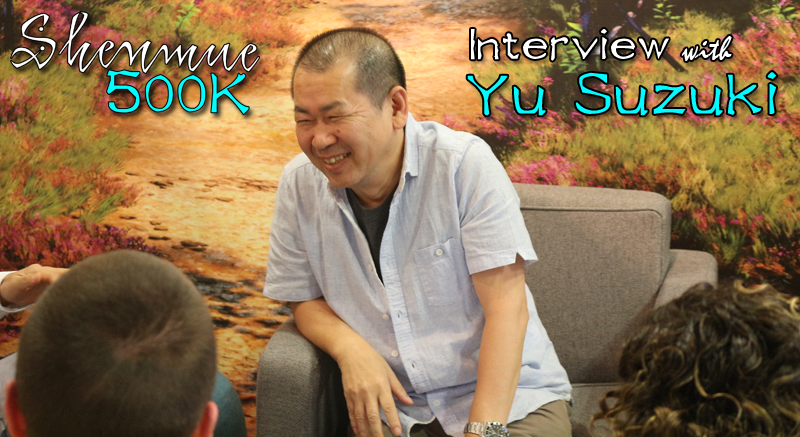 Although not about a fan, Yu-san was keen to tell us a story from the time he was making Shenmue I and II. 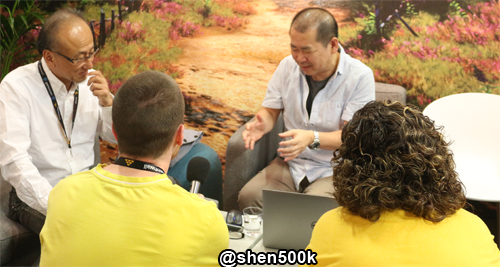 After we thanked the director and executive producer for taking the time to answer so many of Shenmue 500K’s questions, Suzuki-san offered to record a verbal message for the group, which he chose to do in English. We then presented him with a small token of our appreciation, following a theme started in Team Yu’s interview with co-producer Cédric Biscay the previous day. This little gift was also a callback to the MySpace campaign carried out by Nick Wisniewski and many supporters almost a decade ago. 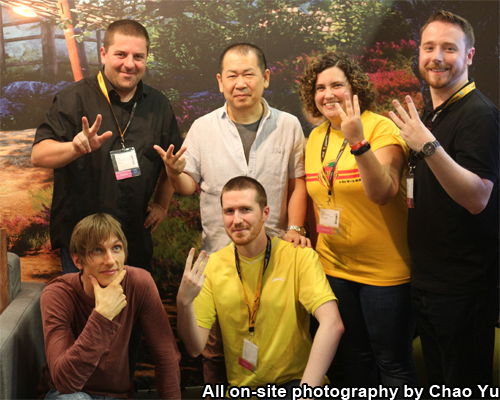 For their help with arranging Shenmue 500K’s first interview with Yu Suzuki we would like to thank the whole team at Shenmue Master as well as Executive Shenmue Ambassador Ali Novin; for his renowned translation skills we owe much of the detail in this write-up to Switch at the Phantom River Stone blog; and for making Gamescom an unforgettable experience we’d also like to thank Peter, Chao, and every Shenmue fan we met in Cologne. Thanks too of course to every Shenmue 500K member who submitted a question. We only wish we could have asked every last one, but we were lucky to get the time we did due to Ys Net’s commitment to the fan community and Deep Silver’s understanding of that unique bond. If you haven’t yet entered our raffle to win a copy of Shenmue II signed by Suzuki-san at the event, check it out before the deadline (which falls during the next #SaveShenmueHD Tweetathon) and help a very worthy cause. Thank you and good luck! Previous Previous post: Welcome to Shenmue500K.net!